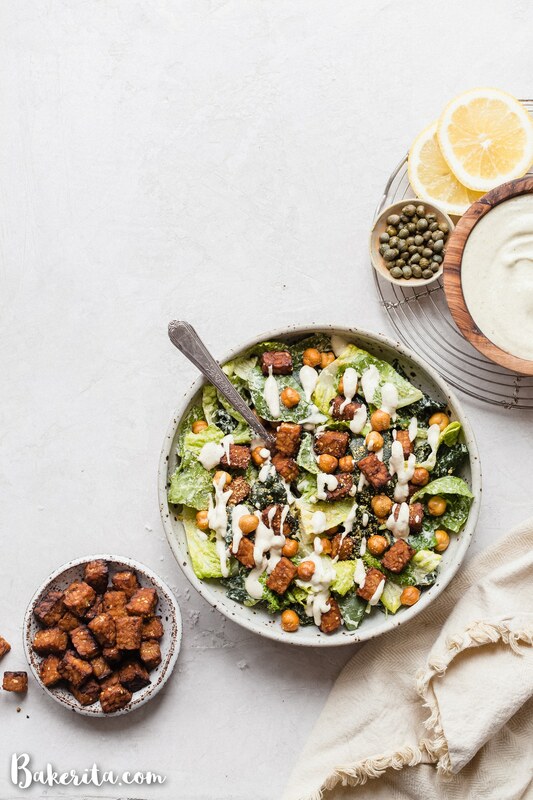 Serve this Vegan Caesar Salad with Crispy Marinated Tempeh & Crunchy Chickpeas for lunch or dinner – it’s delicious anytime! The crispy marined tempeh is incredibly flavorful and filling and the chickpeas add lots of crunch. I just shared my vegan caesar dressing, so of course, I have to share my favorite vegan caesar salad that I’ve been making with that dressing! The first time I made it was a few weeks ago. Ever since, Kyle has been asking me to make it all the time. I must say: we’re hooked. 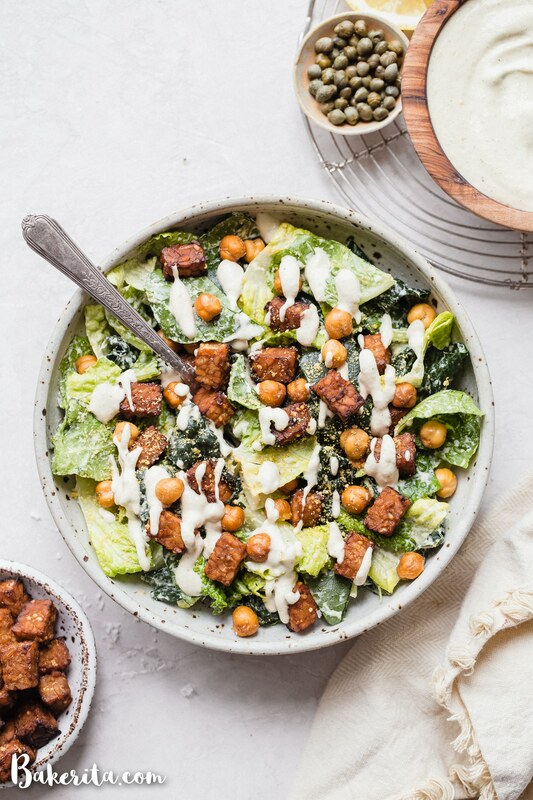 This vegan Caesar salad has a great combination of flavors and textures. This is thanks to the delicious creamy dressing and the variety of crispy, crunchy textures from the add-ins. Let’s make Vegan Caesar Salad! To make the Caesar salad more interesting, I use a combination of Lacinato Kale and Romaine Hearts. With this combination, I get some savory texture from the kale and a lighter crunch from the romaine. You can use one or the other, or choose your favorite lettuce instead. I do recommend trying the combo sometime, though! Now, let’s talk tempeh. I recently became a tempeh lover, and finally figured out my favorite way to prepare it to get it crispy and super flavorful. 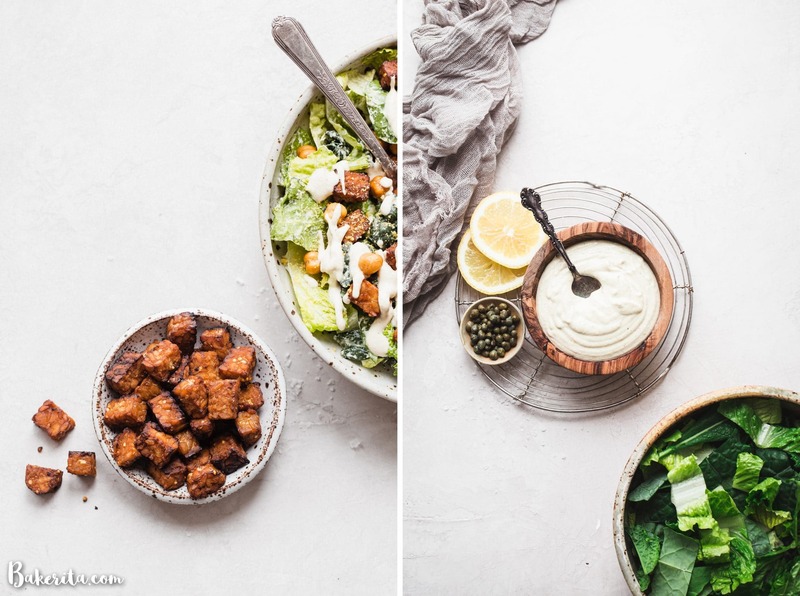 Perfect for this vegan Caesar salad! Before the tempeh goes into the oven, I like to marinate it in some tamari, fresh lemon juice, garlic, and a teensy bit of maple syrup. Even just 10 or so minutes of marinating the tempeh cubes adds a ton of flavor. I find it easiest to mix it up first thing to let the flavors meld. After the marinade, we want to crisp the tempeh up. While I usually like to saute foods to get them crispy, in this case, I like to bake the tempeh. This helps it to get it much crispier. You also use WAY less oil while baking (barely any, actually), which is always a plus. While the tempeh bakes, make the Caesar dressing and get the lettuce all prepped. Once you take the tempeh out of the oven, you can toss together your greens, the tempeh, the crispy chickpeas, and vegan parmesan! I buy the crispy chickpeas at the store to reduce prep time (I like this brand since they use olive oil). However, you can make them yourself using this recipe if preferred (just make sure to adjust the spices to your taste). I also use this vegan parmesan, but you can also make that yourself if you prefer. Here’s a good recipe for a homemade vegan parmesan. 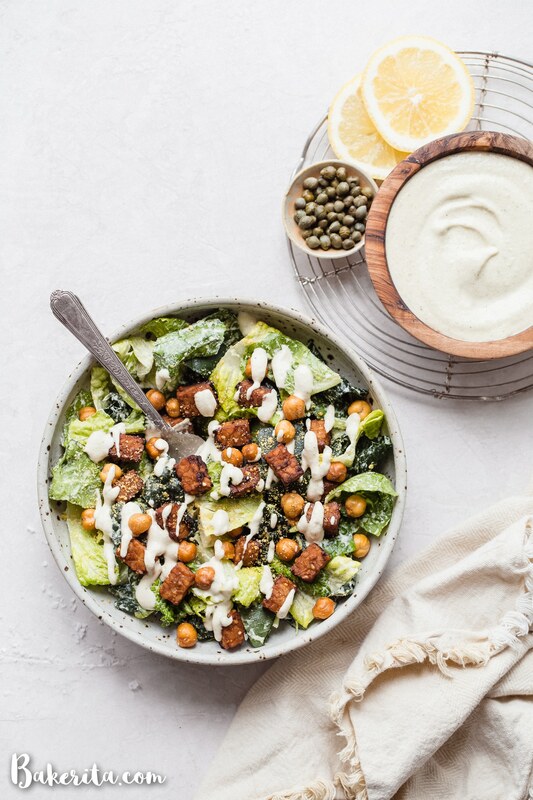 We love eating this vegan Caesar salad for lunch or dinner. It can be the main dinner dish, or you can serve with some roasted veggies. I personally love mixing some broccoli into the salad! If you’re not vegan, you could add some chicken instead of the tempeh. Do your thing – pretty much anything you add will be delicious once it’s coated in that dressing! 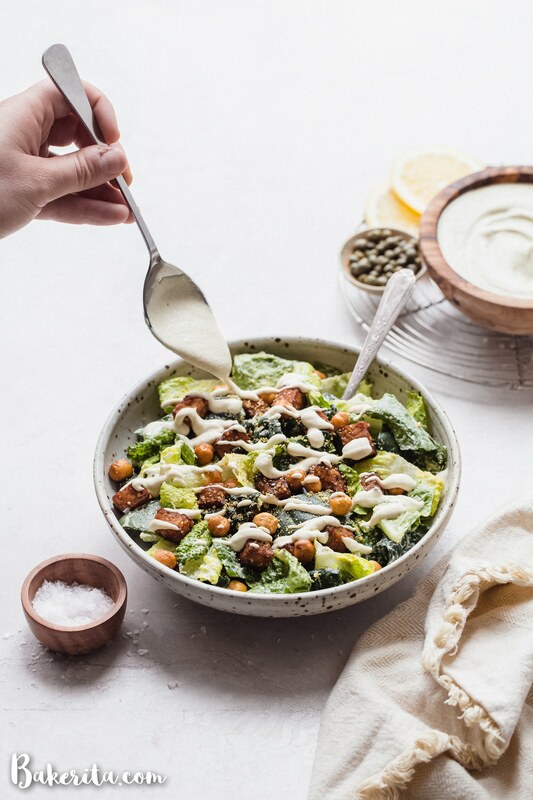 Serve this Vegan Caesar Salad with Crispy Tempeh & Crunchy Chickpeas for lunch or dinner - it's delicious anytime! The crispy marined tempeh is incredibly flavorful and filling and the chickpeas add lots of texture. To see the full dressing recipe, click through to this post. In a mixing bowl, combine the cubed tempeh, tamari, fresh lemon juice, garlic, and maple syrup. Cover and place in the refrigerator. Preheat the oven to 375°F. While the tempeh marinates, line a baking sheet with parchment paper and spray lightly with olive oil or avocado oil. When the oven is preheated, transfer the tempeh from the bowl to the baking sheet, spreading out the cubes so they don't touch each other and leaving any liquid behind in the bowl. Bake the tempeh for 20 to 30 minutes, stirring/flipping once in the middle of cooking time. The tempeh should be dry to the touch and getting slightly browned and crunchy. Cool slightly. While the tempeh is baking, combine the chopped kale and chopped romaine. Once the tempeh is slightly cooled, add the tempeh and crispy chickpeas to the lettuce. Dress with your desired amount of dressing, and then mix in the vegan parmesan. Serve immediately. Keep any leftover dressing in a jar and any leftover tempeh in an airtight container. Nutritional info is calculated for ½ of the prepared salad, which was made using ½ of the prepared salad dressing. It does not include the vegan parmesan. This sounds AMAZING, Rachel! And okay absolutely BRILLIANT idea to add in the capers! I wish you could just bottle this caesar up haha! But I also love how easy it is- will be making for Easter! I hope you love it, Britt! The capers add a delicious briny flavor that give it that “caesar-y” tang that normally comes from anchovies :) thanks for the love, girlie!